Across the board voter turnout was down in 2014. In 2010 about 91 million votes were cast and turnout among the voting eligible population was 41.8 percent. Four years later only 81 million peopled voted for a turnout rate of 35.9 percent according to data collected by Professor Michael McDonald. Looking at Democratic losses in states such as Colorado, Florida and Illinois, some observers questioned whether Latino turnout in particular was even lower. While not all 50 states have data available on official validated vote in 2014 yet, most states have now reported vote history and we can assess what happened in the 2014 midterms. One concern raised in 2014 was whether or not Latino voters felt connected to the candidates, whether they were enthusiastic about turning out, and whether or not targeted mobilization efforts were even present. By looking at official turnout statistics we can shine some light on these concerns and questions. L2 Voter Mapping provides detailed data on the number of registered voters, and votes cast in November 2014 with estimates by race and ethnicity. The L2 database identifying Latino voters is extremely reliable, as Latino Decisions has validated in previous surveys and research. 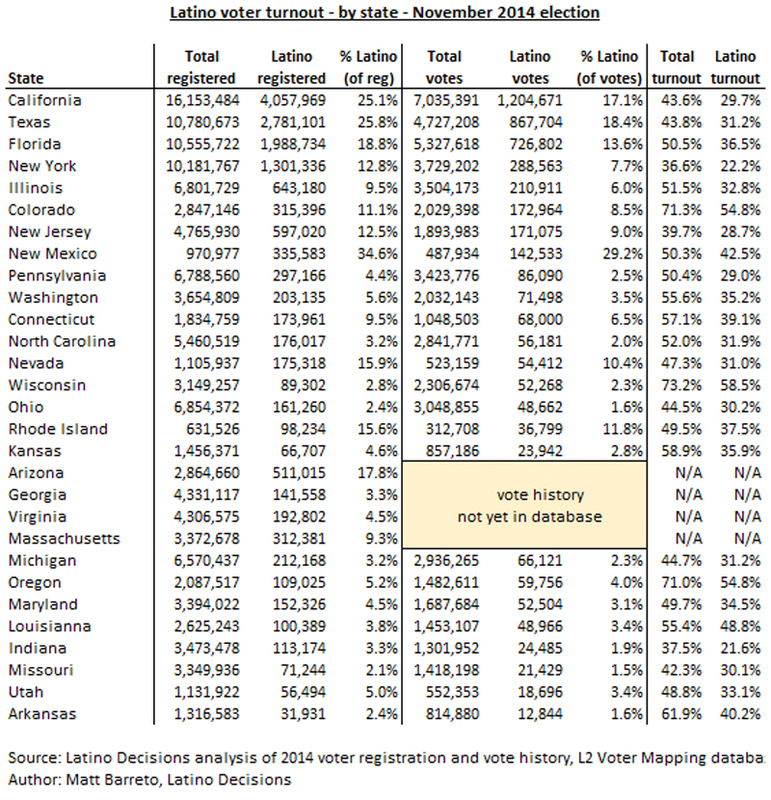 While turnout was generally low in 2014, among Latino registered voters it was even lower. For example, Latino turnout in Florida was only 36.5 percent compared to 50.5 percent statewide. In 2010, Census data suggest the Latino turnout rate was roughly equal to non-Latino turnout in Florida. In 2014, there was a significant decline in Latino turnout in Florida. In fact, if Latino turnout rate had been equivalent to the statewide average–as it was in 2010–an additional 276,000 Latino votes would have been cast. Given the Florida Governor’s election was decided by just 64,000 votes, those additional 276,000 Latino votes could have proved critical. In Colorado a similar story unfolded where the U.S. Senate election was decided by about 40,000 votes. Latino turnout was 54.8 percent compared to 71.3 percent statewide among active registered voters in 2014. Had Latino turnout been equivalent to the statewide average about 52,000 additional Latino votes would have been cast. Across each state for which official vote history data is available in 2014, Latino turnout among those registered was significantly lower than the statewide average. In some places we found a 5-point gap, in other states the turnout gap was over 20 points. In some states with few competitive elections such as California, turnout was exceptionally low, at only 29.7 percent among registered Latinos. Likewise, Nevada witnessed only 31.0 percent turnout among Latinos in 2014 when 2010 and 2012 had reported dramatically higher voter turnout among Nevada Latinos. Part of the drop off in Latino turnout points to a lack of competitive statewide elections. In other instances it points to a lack of effort in mobilizing and connecting with the Latino electorate. Rather than blame Latino voters–Why was your turnout so low? Don’t you care who wins?–we should think about how well the candidates for office in 2014, did or did not make their case to Latino voters. Few Americans will rush to the polling booth if they don’t think the candidates care about their community or issues important to them. Or if they don’t see much differentiation between the two options. This is not to say that no 2014 candidates cared about Latinos, certainly many did; or that there were not stark differences between their issues, certainly there were. Rather, the data here suggest that candidates in 2014 did not do a good enough job convincing Latino voters that they truly cared, or that they would stand for their issues. Matt A. Barreto is co-founder of the polling and research firm Latino Decisions. Barreto is Professor of Political Science at the UCLA and co-author (with Gary Segura) of the just published book, Latino America: How America’s Dynamic Population is Poised to Transform the Politics of the Nation.